If you want to start your day with a scenic sunrise or you want to drown your everyday stresses while watching the sun set then there’s then the Breezy Beach or Thiruvanmiyur Beach is one of the best places to do so. Found in the Thiruvanmiyur neighbourhood it is one of the remaining unspoiled beaches of Chennai. Composed of clean waters and golden sand the beach could be a perfect place to conduct water sports. Since it’s really close to the IT corridor, many professionals often stroll onto the beach for a change of scenery. The Olive Ridley Turtles can be spotted at the Thiruvanmiyur beach during their nesting season. Those who are interested can sign up for a turtle walk. The beach promenade is lined up with various stalls selling a wide range of delicacies. Seafood lovers could try out items like fried fish, prawn or octopus. Many visitors love to take strolls along the promenade and watch the hawkers in action. Tourists could also visit the Marundeeswarar Temple which is located nearby or they can wander off to Mahabalipuram. Elliot’s Beach or Besant Nagar beach has a peaceful aura which is spiced up by visitors and attractions mostly in the form of eateries. It is one of the tidiest and well-maintained beaches in Tamil Nadu. The beach has a more urban vibe than the others located nearby and it derives its name from Edward Elliot who was a former Chief Magistrate and Superintendent of police under the Madras Presidency. One can also gorge on a variety of food. If visitors prefer street food, they could try out items like fried fish, corn on the cob, and sundal. If street food is not their cup of tea than visitors can tantalize their taste buds at any of the nearby restaurants such as Ponnuswamy Restaurant, Karaikudi Restaurant, and Lees Chinese Restaurant. One could engage themselves by visiting the neighbourhood of Besant Nagar where there are hundreds of things to do. They could soak up some local culture at the Kalakshetra Foundation, visit temples such as the Ashtalakshmi Temple or the Annai Velankanni Church and visitors could also go library hopping. Located amidst the city of Chennai the Marina beach is both historically and geographically significant for India. Situated along the Bay of Bengal its total length spans to over a distance of 13 kilometres. This kind of justifies the fact that it is called as the world’s second longest urban beach. No beach in India is longer than the Marina beach. The Marina beach had been created as a result of consistent sand deposits while building the Madras Harbour. It was due to the efforts of the former Governor Mountstaurt Elphinstone Grand Duff that today the Marina beach is one of India’s most visited beaches. The Marina Beach Road is an architecturally rich area and it houses many exquisite buildings such as the University of Madras, the Senate House, the Chepauk Place, Presidency College, PWD office, and the Ice House. The beach is also home to many historically significant structures such as the Annadurai MG Ramchandran Memorials; Indo Saracenic Monuments; and a variety of statues representing Tamilian Heroes, Tamilian Scholars, and other famous Indians. One popular statue is the Victory of Labour. Tourists could also visit the aquarium which has a diverse collection of salt and freshwater fishes. Another tourist attraction is the Ice House which had been used during the colonial rule to preserve ice brought in from North America. The Pebble Beach located towards the outskirts of Chennai is small and kind of isolated but it radiates serenity and provides individuals with an opportunity of self-contemplation. 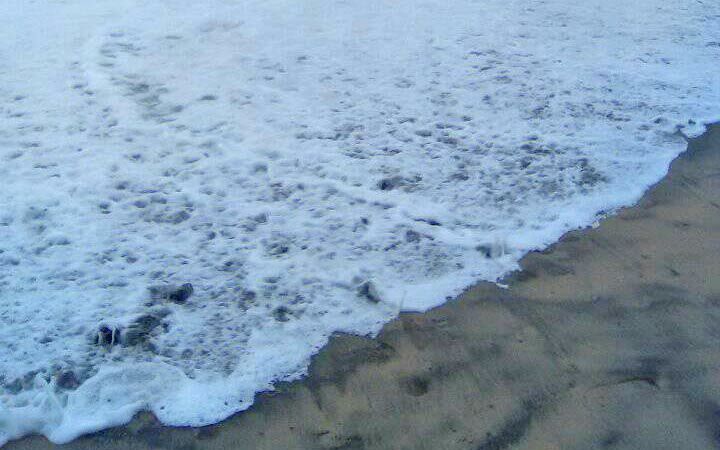 The beach produces majestic white waves which could be advantageous for the practice of water sports like surfing but not for amateurs due to the presence of a strong undercurrent. The beach is perfect for solitude lovers who could relax here without being troubled by bustling crowds. Many locals can be seen taking evening and morning walks along the beach. Couples seeking a place to spend some time with each other could also visit this destination. The place is also perfect for photography and other kinds of cinematic shoots involving nature. The Pebble beach is lined with a wide range of eateries serving diverse cuisines like Chinese, North Indian, and South Indian. Travelers could visit the Thiruvanmiyur beach which is only one kilometre away from Pebble Beach. Southern India provides tourists with some of the best beaches, where they can spend a day or two frolicking, amidst the sun and sand. One such beach is Tamilnadu’s Covelong Beach, which provides the ideal atmosphere for coastal relaxation. Also recognised as the Kovalam beach it’s an outlet of the Bay of Bengal which can be found on the Coromandel Coast. Tourists can enjoy a range of water sports at the beach such as windsurfing, swimming, and angling. Covelong Beach also succeeds in pulling in fishing enthusiasts. The Covelong beach also exhibits historical ruins in the form of an Old Catholic Church and the remains of a Dutch Fort present along its shoreline. While visiting Covelong Beach tourists could also spend some time at the Covelong Village where many intricately built temples, mosques, and churches can be found. Apart from the above-mentioned attractions visitors could also spend some time the Crocodile Farm nearby. Tourists could also add Mahabalipuram to their itinerary while visiting Covelong Beach. It is the birthplace of one of the oldest civilizations and it houses some exquisite shore temples. Neelankarai beach is ideal for those who desire to deviate from the beaten track and tread towards the unexplored. Not many travellers know about this coastal haven which can be found at the town of Neelamkarai in Chennai. Neelankarai stands for blues shores and it is shared between Palavakkam, Vettuvankeni and the Bay of Bengal located in the north, south, and east respectively. The beach provides tourists with a chance to rejuvenate themselves. The limited crowd provides visitors with the perfect opportunity to spend some time alone with themselves or with their loved ones without being disturbed by the usual chaos present at other tourist destinations. Visitors could take a stroll along the beach, take a dip in the water and even enjoy a picnic along the shores of the beach on a sunny day. The beach is also home to a healthy population of turtles and if the tourists are lucky, they admire the turtle paddling across the shores of the Neelankarai beach. Visitors could also visit the small town of Neelankarai to quench their thirst for exploration. Santhome Beach, situated in Mylapore’s Santhome town in Chennai exhibits the right proportion of history, scenery, and attractions to keep tourists engaged. It is a part of the southern section of the Marina Beach and it provides tourists with a view of very raw coastal beauty. The beach derives its name from Saint Thomas, who had been one of Jesus Christ’s disciples. After being martyred his tomb was built in Mylapore. Now the Saint Thomas Basilica exists over the tomb. The baech is situated exactly behind the Santhome Cathedral and it’s the spot where the Portuguese invaders first landed after arriving at the coast of Chennai. Many tourists love to talk walk along the shores of the beach while enjoying delicacies like fried sea food and sundal. Tourists visiting the Santhome beach can also explore other beaches like the Marina Beach and the Elliot beach which are located nearby. The St. Thomas Museum and the Kapaleshwarar Temple are some other attractions found close by. If you’re looking to go to someplace with your friends or family where you can spend your time doing something new every hour then the VGP Golden beach near Akkarai Beach is the best destination for you. Situated in the city of Chennai along the Bay of Bengal, it is a private beach attached to the VGP Universal Kingdom, an amusement park which will spark up your life. Mr. VG Paneerdas had developed the Golden Beach and the VGP Universal Kingdom with the vision of creating a thrilling and engaging site for families or friends to spend their time at. The various attractions that can be found at the amusement park have been created by taking inspiration from other theme parks found in Italy, USA, Japan and so on. The Park has been divided into the Universal Kingdom, The Aquatic Kingdom, and The Snow Kingdom. Some of the popular rides are the Water Chutes, Go Karting and dashing cars. Other crowd pullers include the petting zoo, Paneer Fort, VGP 2000 Millennium Tower, Statue Man, and the Jurassic Park. Tourists could also enjoy water sports like surfing at the beach and fill their stomachs at eateries like the Golden Chakra. If you’re looking for a beach in Tamil Nadu which can satisfy history buffs, thrill seekers, foodies, shopaholics and many more then you should visit the Mahabalipuram beach also known as Mamallapuram. The beach is popular for its Shore Temple which had been constructed in the 8th century on the guidelines of Dravidian architecture. Very few temples in South India are as ancient as the Shore Temple. One attractive feature associated with the temple is that the structures present inside it light up when flood light falls on them. One can also visit the Five Rathas or the Five Chariot Temples which have been dedicated to the Pandavas and are made of rock. Other rock carvings can also be found which mostly had been made by the Pallavas in the seventh century. Visitors could also explore sites like Tigers Cave, Arjunas Penance and Dakshinachitra or they could wander off towards the hill on the western side of the Mahabalipuram Town which has many attractions such as Krishna’s Butterball, temples, carved monuments and a lighthouse. Tourists could also visit the Kadambi village, the crocodile bank or the snake venom extracting centre. Tourists could visit the beach during the annual dance festival of Mahabalipuram and soak up the local culture. Tourists could also tantalize there taste buds at various eateries like Moonrakers and Geckos Café.